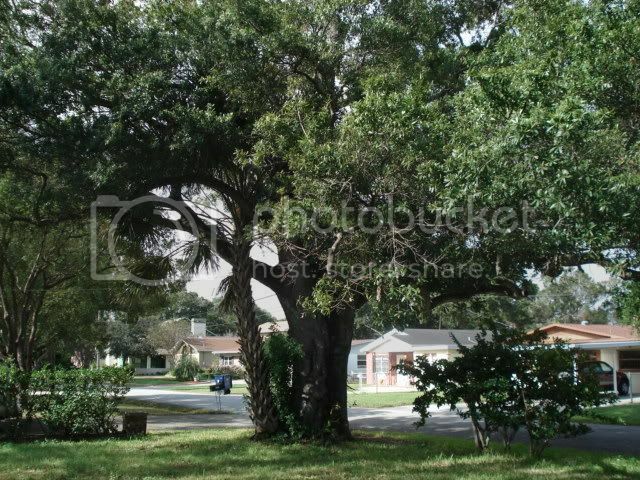 There’s a big old oak tree out in my front yard that’s probably almost 100 years old. It was there when my father bought this property and started building this house. That was in 1953 or so. The tree was old then. It was probably a sapling when Coolidge was President. Of course, at that time the tree had many brothers and sisters around to keep it company because this whole area was woods back then. When my brother, Steve, was a small boy, in the late 50s and early 60s, he built a tree house up in the branches of this big old oak. My mom would pass his lunch to him using a rope that he would lower down to her. He also had a tire swing in the old oak. The kids even had an official tire swing tester… a pudgy boy named Alan had the honors of testing the rope’s strength. Even then the tree was already old. It was also hollow. It had a large triangular hole at its base that was large enough that a boy could climb inside of it. The hole has since almost healed up. It’s only big enough for a small animal, like a cat, to climb in now. A few years after my brother had his tire swing and tree house, I would have my chance to claim the old oak as my playground. My father, my godfather next door, and my father’s friend Tony from across the street got up in that tree one Saturday afternoon and built me the “Hilton” of tree houses. It was about 8’ X 8’ and slightly pie-shaped. It was about 10’ off the ground, not as high as my brother’s, which still had some rotted shards of wood nailed to some upper branches to attest to its existence a few years before, but much more elaborate in its design. I still remember that day. It was probably 35 years ago, but I can still see those men and my father up in those branches hammering and sawing to build this tree house. Hell, I think they were having as much fun building it as I was to have playing in it. I can still remember my father beckoning me up the ladder later in the early evening of that hot summer’s day I climbed up rung by rung, slowly, the way he taught me to. I stepped on the floor of that tree house and was amazed at how high up I seemed. In the years that followed, that tree house was as many different things as a boy’s imagination can dream up. It was a tri-masted sailing ship exploring the South Pacific or fighting pirates in the Caribbean. It was a submarine torpedoing Jap ships in the Coral Sea. It was a fighter jet, a space ship, a jungle lair, a medieval castle, and it was just a plain ole’ clubhouse for the gang. That tree house stayed up in that tree for many years, through storms, through winters and summers, through marauding, vandal kids from other neighborhoods. It withstood them all. Years later, my friend Ernie and I decided to build a second level up on some higher branches. We got some old tongue and groove pine siding from an old lady named Katy, who lived down the block. She had about 20 of these little annoying beagle dogs. When a car would go down the street, all these little dogs would come running like hellions out of this lady’s driveway and chase the car halfway down the block. They’d chase bicycles too. They didn’t bite, just yelp a lot. Anyway, Katy had all this pine siding stacked up on her property, which was a playground for all the neighborhood kids. The place was all wooded and wild. We’d play “War” for hours on this old lady’s land. She told Ernie and I that she’d be more than happy to let us take that scrap wood. So we did… down the block we dragged all that lumber. We hoisted it up into the tree house and began our little construction project. We were about 12 years old. The construction went well. In about a week, we had this really cool smaller upper level to play in. My dad gave us some old leftover paint. Who knows what he used it for… it was lime green. So Ernie and I commenced to paint the “Penthouse”, as we called it, lime green. We even dusted the tree with Chlordane dust to get rid of the ants and roaches, and we ran an extension cord from the house so we could have radio and a light up there at night. It was so cool! Unfortunately, being on the verge of the “teens”, we soon lost interest in tree houses and turned our attention to cars and girls, in that order. The older tree house that my dad had built for me finally rotted away to nothing. The newer upper level that Ernie and I built deteriorated over the years. There is still some of it up there in the old oak even as I write this in 2001. That ole’ pine that Katy gave us was ancient when she gave it to us. Now it’s petrified! Ernie and I built that upper level 27 years ago right now this summer. My! How time flies. My brother put a tire swing up for me too about the time my dad built the tree house for me. It’s long gone too. That old oak is still standin’, though. Every March it blooms and makes me sneeze like hell, but it’s still there. It is a little stressed since we’ve been in a drought here in this area of Florida for a couple years now, but it keeps hangin’ in there. Hell, it may outlive me like it outlived John Drew’s kids, and my grandfather, and my dad. I love the old oak. There have been a couple times when neighbors suggested that it be cut down. “You gotta’ go through me first!” I’d tell them. There’s a lot of history in the bark on that tree… the scars of kids with hatchets, old nail wounds, rotten lumber still attached… all the scars left by all the children who played in that tree in the past 50 years, like the medals awarded by the god of the forest to one of his deserving children who stood tall and shaded the children at play and gave them branches to climb on and limbs to swing from. Sometimes I feel akin to that tree, like it watched over me and kept me from harm while I played in my yard as a child. Now we watch over each other with eyes wizened by the years of mutual losses. The tree has lost its many leaves and I, well… I’ve lost my many loves. Posted by V. T. Eric Layton on 17 January 2011 in Story Time and tagged Alan, brother, dad, Ernie, The Oak Tree, treehouse. What a fabulous post! Thank you. Wonderful story Eric! Thanks for posting it.